User warning: You have an error in your SQL syntax; check the manual that corresponds to your MySQL server version for the right syntax to use near &#039;IS NOT NULL) AND (term_data.tid = 105978) ) LIMIT 0, 9&#039; at line 8 query: SELECT DISTINCT term_data.tid AS tid, term_data.name AS term_data_name, term_data.vid AS term_data_vid, files_term_fields_term.filepath AS files_term_fields_term_filepath FROM term_data term_data LEFT JOIN term_fields_term term_fields_term ON term_data.tid = term_fields_term.tid LEFT JOIN files files_term_fields_term ON term_fields_term.province_map_fid = files_term_fields_term.fid LEFT JOIN domain_taxonomy_access dta ON dta.tid = term_data.tid WHERE ((dta.grant_view &gt;= 1 AND ((dta.gid = 0 AND dta.realm = &#039;domain_site&#039;) OR (dta.gid = 21 AND dta.realm = &#039;domain_id&#039;))) OR term_data.vid IN(23,12,1,13,7,16,15,22,20,21,37,32,17,6,5,41,42,40,44,43,34,49,38,55,54,25,48,18,10,53,9,46,28,29,30,47,24,8,19,31,3,11,14,27,26,2,57)) AND ( (term_data.vid in (&#039;87&#039;)) AND (.fid IS NOT NULL) AND (term_data.tid = 105978) ) LIMIT 0, 9 in _db_query() (line 169 of /home/gotaormi/public_html/includes/database.mysqli.inc). Casa Lisa is a wonderful cottage in Tuscan style dating back to XVII cent. and renovated with great enthusiasm by the owners in 10 years time for the purpose of creating a place where the whole family could get together during the holidays. The house has extensive and completely fenced grounds with several trees and plants. There are a table and chairs for dining al fresco, a gazebo also equipped with garden furniture and 2 hammocks are available for the guest’use. Furthermore, in the garden there are a big fountain and a wonderful swimming pool set in the earth (10 x 5 m deep1,40 m) with sun lounges und sun umbrella. With the materials recovered during the refurbishing works the owners have built a small stone building with grill and wood burning oven within the garden. Entrance on the ground floor: living room with a spacious sofa, two armchairs and a two-seat smaller sofa, a big fire-place, a table, a flat screen TV, a door with exit onto the garden, a door with exit onto a beautiful veranda equipped with basket table and chairs. Typical Tuscan style kitchen with a big fireplace, table with chairs for 6 people, stone basin, TV, fridge, freezer, stove/oven, toaster, dish washer, a door with exit onto the garden. On the ground floor 2 rooms are closed to the public, they are used by the owners and have an independent access. 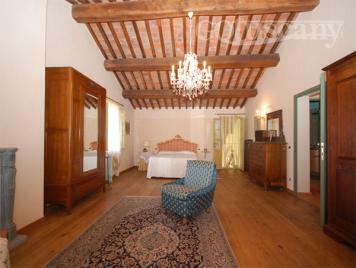 All the rooms on the ground floor have terracotta tiled floors and beamed ceilings. Stone stairs onto the 1st floor: 1 bathroom with 2 basins, wc, bidet, shower, 1 bathroom with wc, bidet, shower, 1 gorgeous master bedroom (8 x 5m) recovered from a prior barn with double bed, single bed, spacious guard robes, chest of drawers, stone fireplace (not to be used) and window/door looking down on the veranda. The bedrooms has wonderful views onto the surrounding landscape. 1 double bedroom with master bed, guard robe, green pastel colour walls and views onto the garden. 1 twin bedroom with 2 single beds, blue pastel colour walls, guard robe and views onto the garden. 1 twin bedroom with single beds, guard robe and two windows. All the bedrooms have parquet tiled floors and sloping roof. Washing machine for private use of the guests. Covered parking for three houses. The holiday home Casa Lisa is particularly suitable for families with children. Close to the house there is an agility dog camp. The area offers several day trips possibilities to the most famous Tuscan art cities, to the coast and to neighbouring towns. The highway is within easy reach. The owners keep for themselves the use of 2 rooms downstairs (which are, therefore, closed to guests and have an independent access) in order to take care of the pool and garden maintenance. They will respect the guests’ privacy and will not use the garden and the pool, which are entirely available for the guests only.